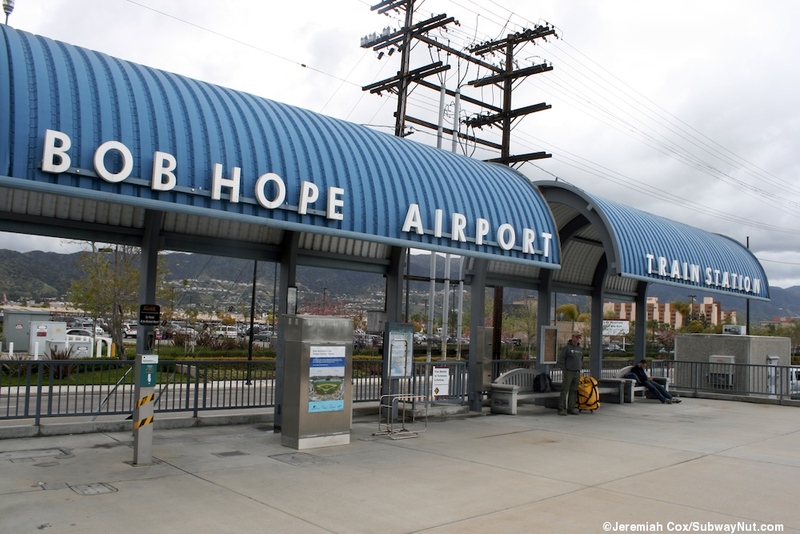 Burbank-Bob Hope Airport Station (all the station signs now say just Bob Hope Airport Station) is presently just a simple unstaffed station with two platforms on the southern edge of the Bob Hope Airport. 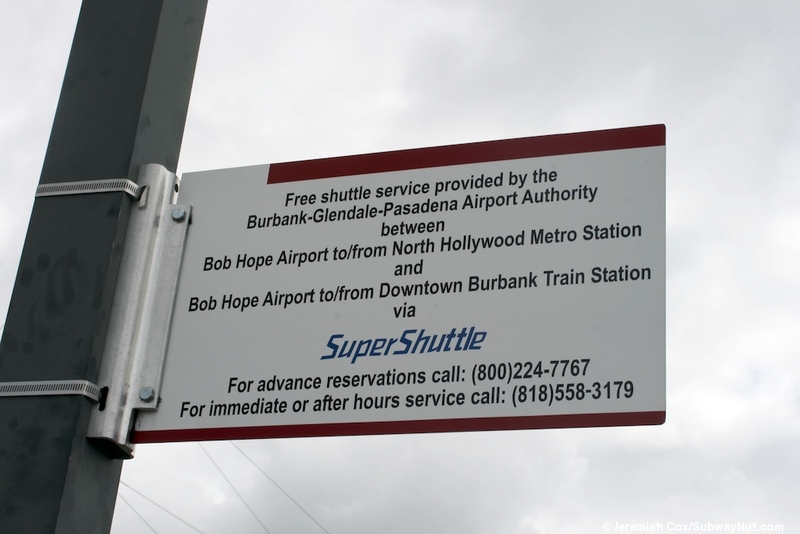 A free shuttle bus can be called to access the airline terminal (less than a quarter mile away) but there is also a sidewalk the entire way and it is easily walkable. 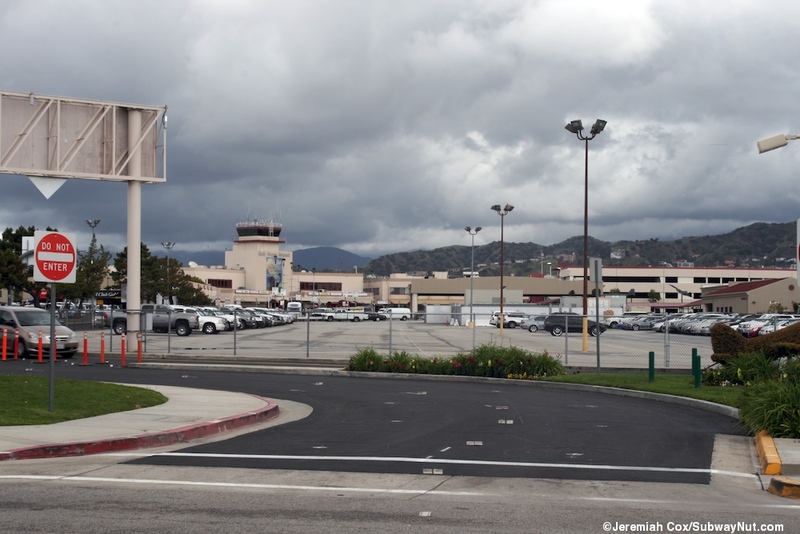 The location though is slated to become the Regional Intermodal Transportation Center at Bob Hope Airport with trains and buses will be on the ground floor of a parking garage housing a central airport car rental structure. The station has had an interesting history. It first opened on June 1, 1990 and was closed by October 1991. That timetable has a note that service "has been suspended due to track reconfiguration by the Southern California Regional Rail Authority." 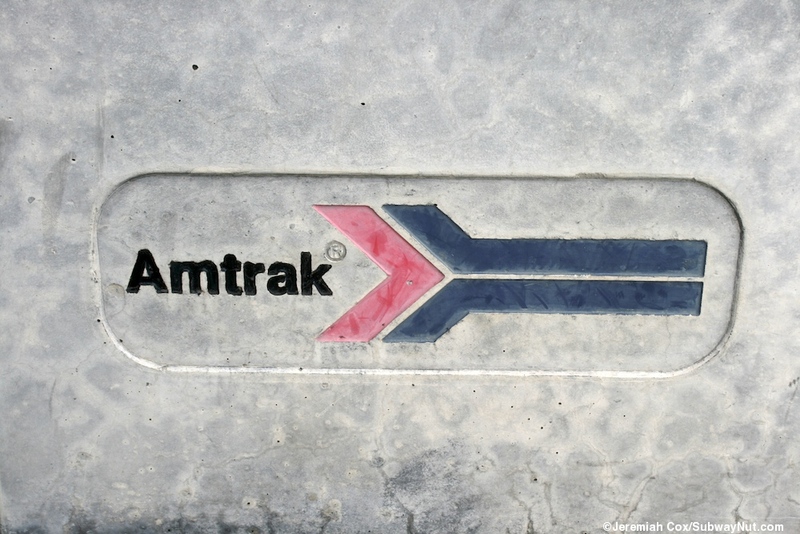 The tracks were being improved for the creation of Metrolink. 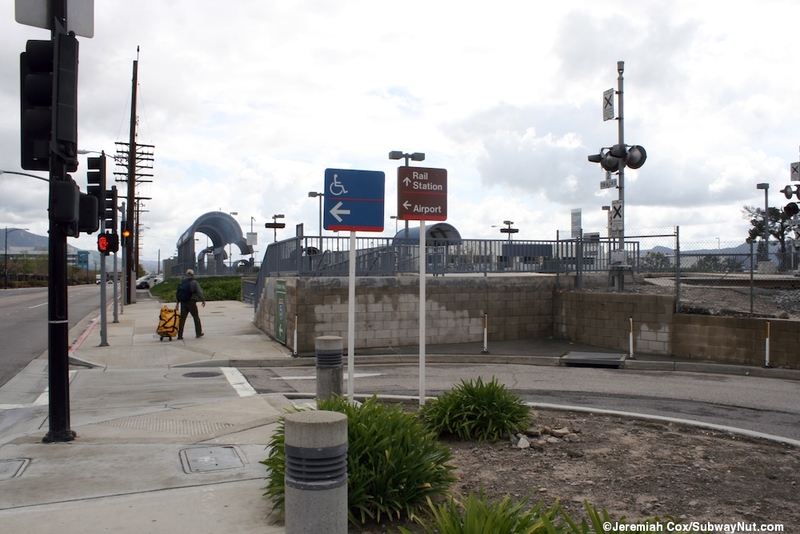 Today's station finally reopened on February 4, 1994 after being rushed to completion after the Northridge Earthquake ('Burbank Airport Amtrak Station Opens' Daily News of L.A., February 5, 1994, Link). Then it only served San Diegan Trains (two round-trip trains per day at the time). 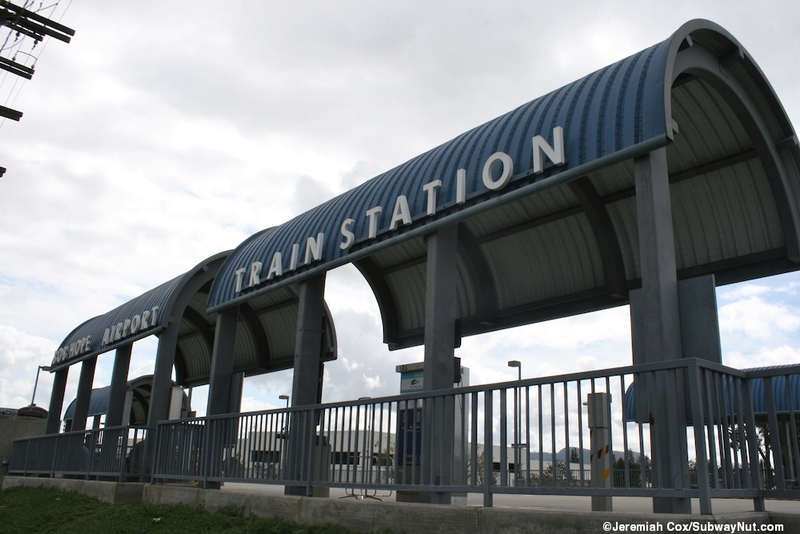 On April 24, 1995 Metrolink ('Metrolink Stops at New Burbank Airport Station' Daily News of LA, April 25, 1995 Link) began stopping at the station as a pilot service changed and has served the station ever since. Today the station has its own special rules in the Rail 2 Rail program with Amtrak accepting all Metrolink ticket types (not just Metrolink Monthly passes) to help airport travelers use their five daily round-trips into L.A. Amtrak service is supplemented by the Coast Starlight which began stopping at the station for the first time in the October 8, 2010 timetable. 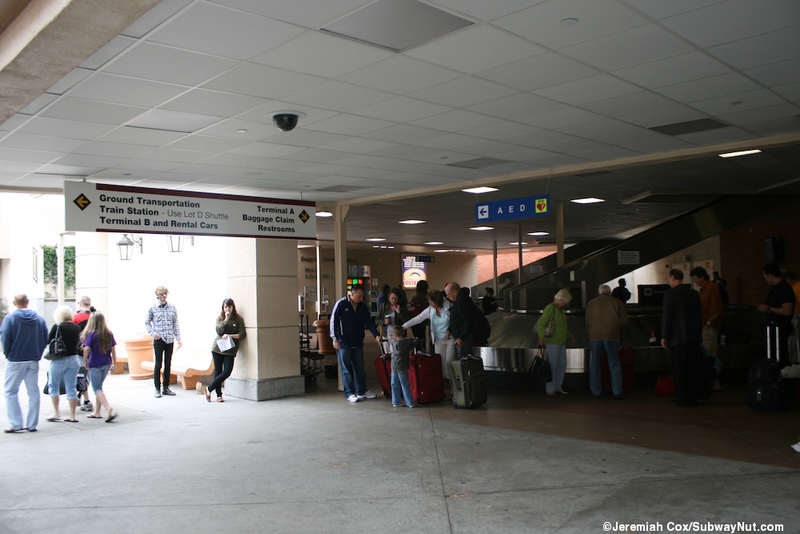 Today Metrolink runs a total of 16 outbound and 15 inbound trains per day. 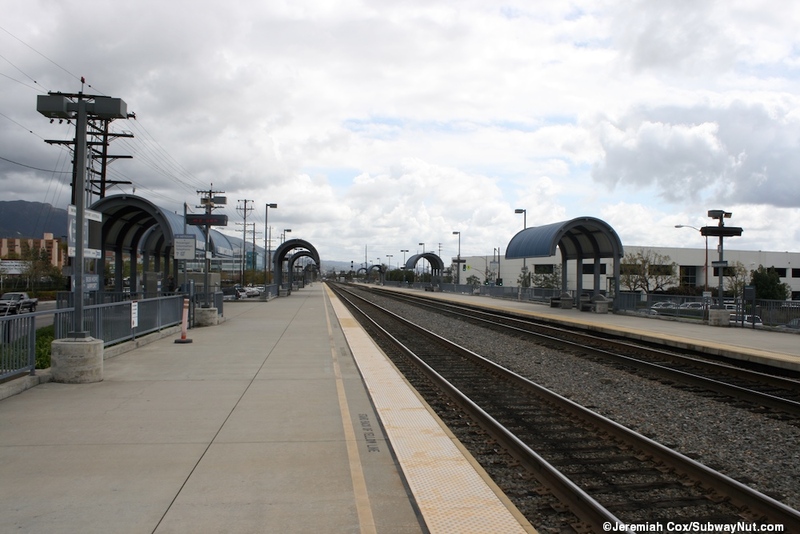 Ten of Metrolink round-trips per weekday with (six during peak direction rush hours, two reverse peak trips and two midday trips) stop at the station as an intermediate stop running to Chatsworth (3), Moorpark (4), and East Ventura (3). 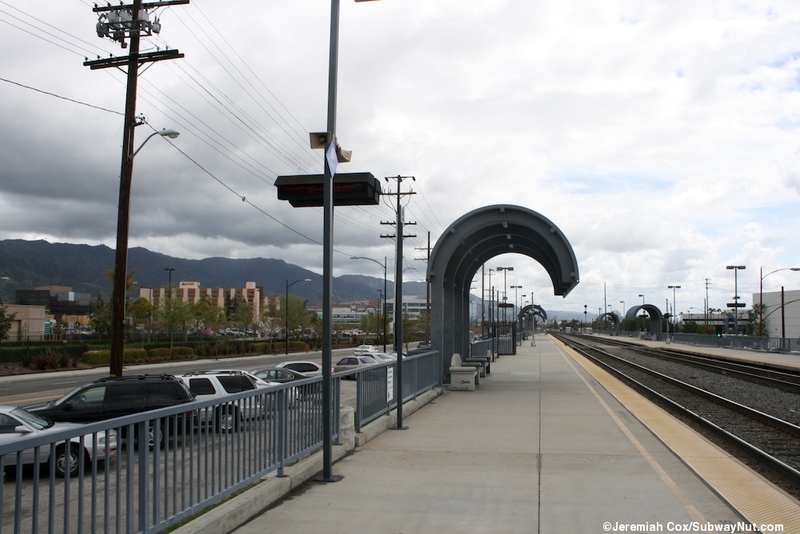 The rest of the trains are special supplemental rush-hour round-trips from the station (via Downtown Burbank and Glendale) into Los Angeles. 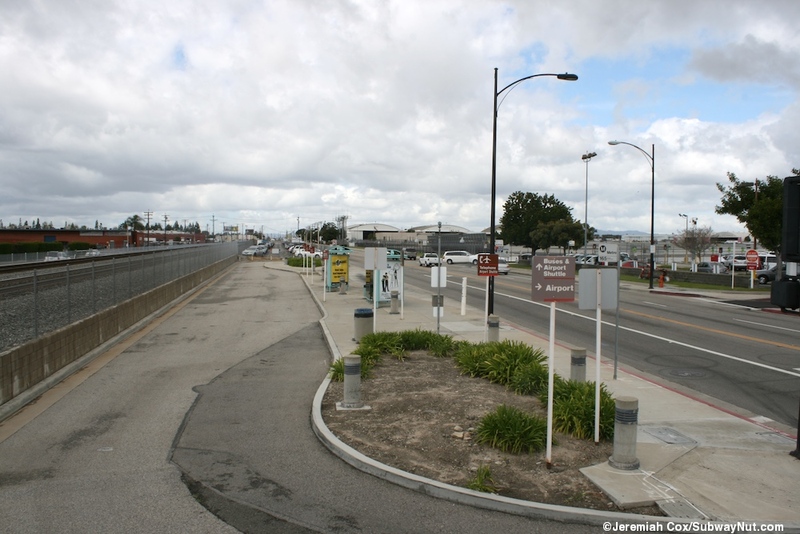 The stop also has a heavily used Amtrak Thurway bus stop outside the station, these have buses stopping six times per day to Bakersfield to connect to every daily San Joaquin round-trip. 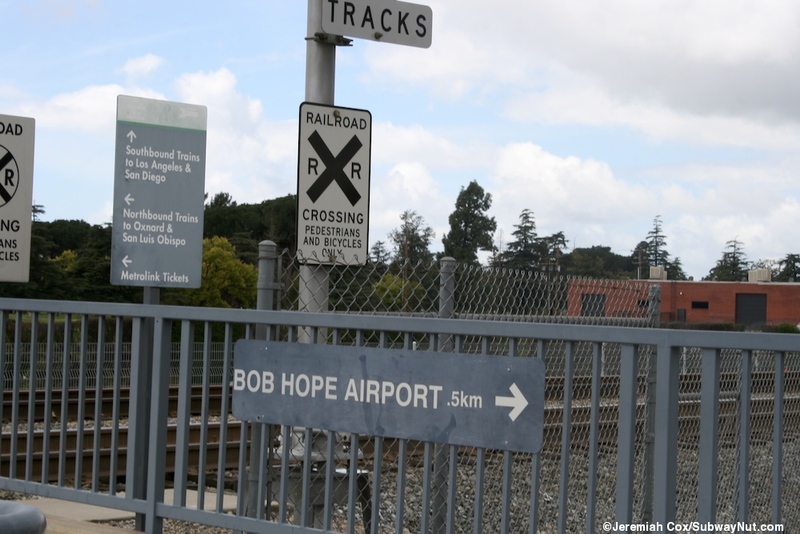 Todays Bob Hope Airport Station is on the southern end of the airport property and has two side platforms for a two track line, lacking a fence between the tracks, one with the north platform along Empire Avenue and the south platform on Vanowen Street. 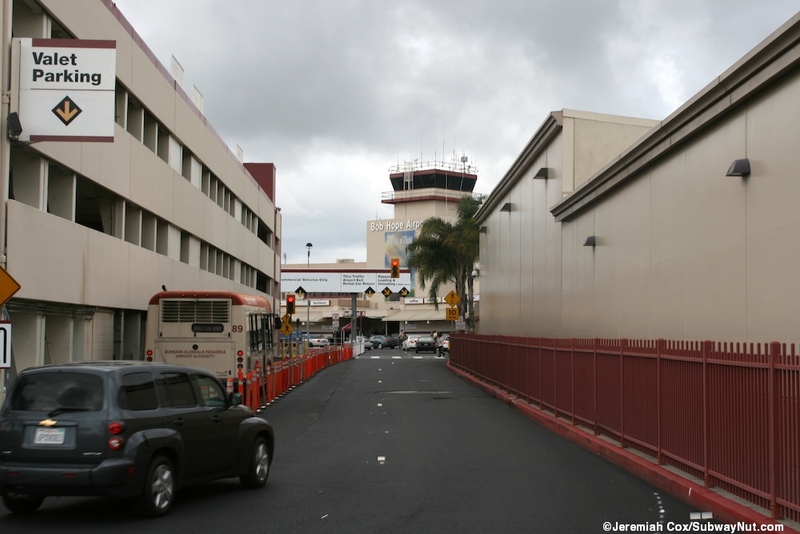 This is all just west of Hollywood Way's underpass that includes these two local, four-lane, two-way streets as well. 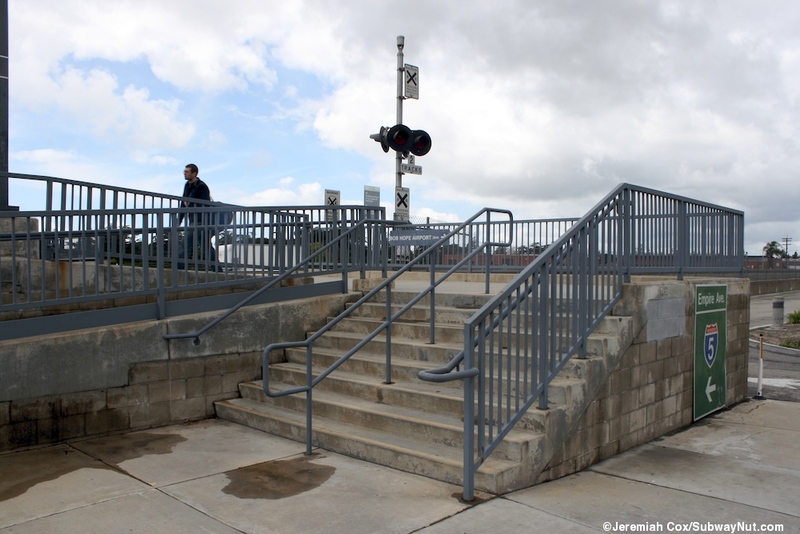 The platforms are slightly raised on concrete above the street with ramps and staircases up to them. 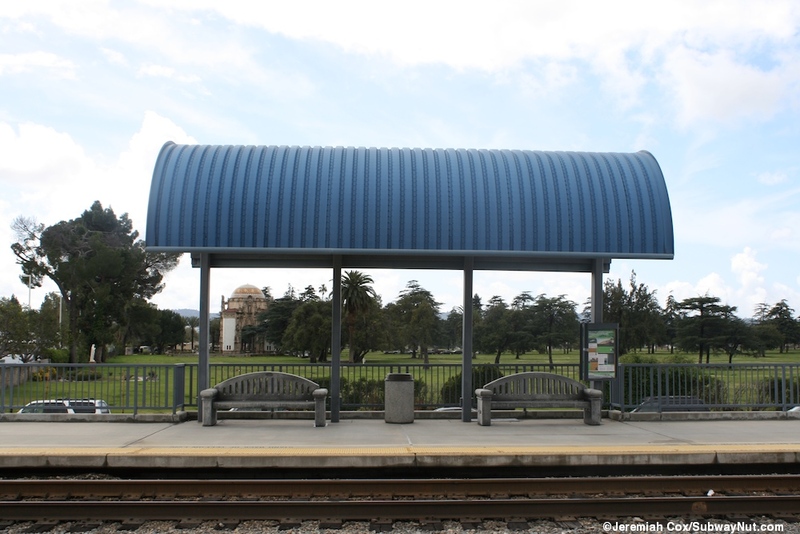 Each platform has four modern blue half-circular canopies held up by grey steel. 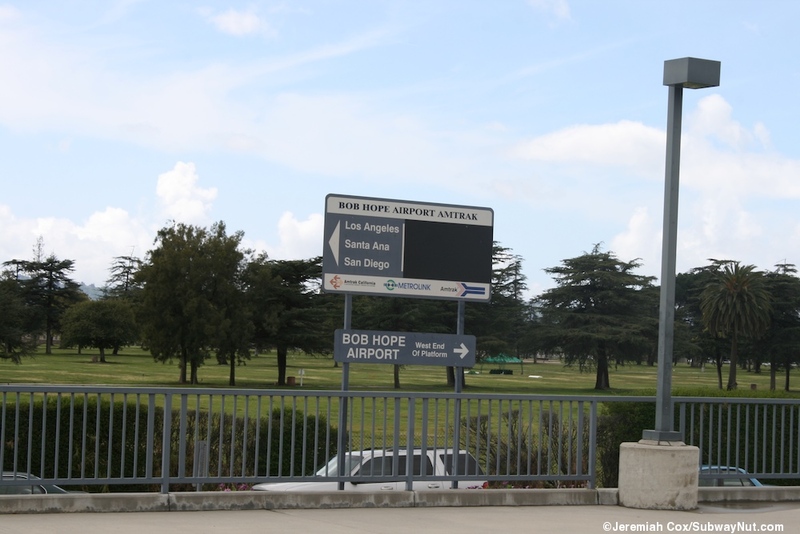 These have concrete benches beneath them and the sides of the benches are engraved with either the pointless arrow logo for Amtrak, the logo of the Burbank-Glendale-Pasadena Airport (until it was renamed for Bob Hope in 2003), or the old Amtrak California logo. 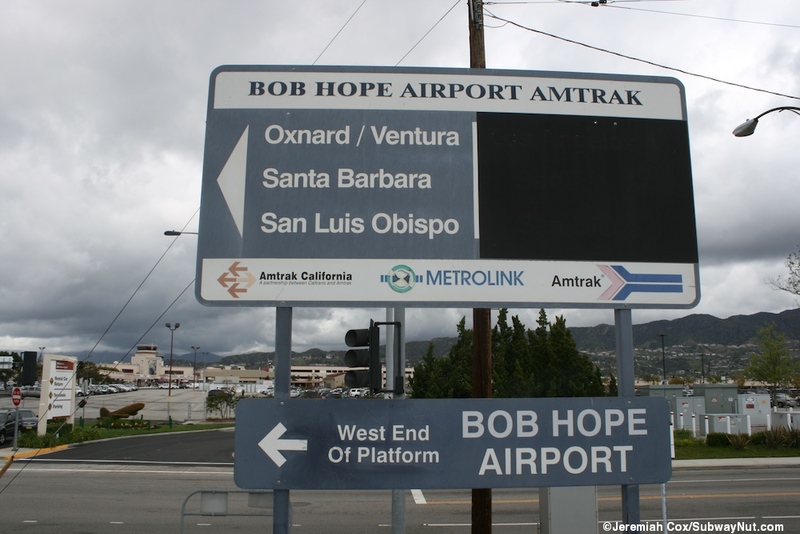 Platform signs are in the standard Metrolink format where it is clear that Bob Hope Airport Station has been lettered over Burbank Airport Station with the ghosts of old letters visible, and odd signs that say Bob Hope Airport Amtrak on top of three train destinations and the three company logos beneath. 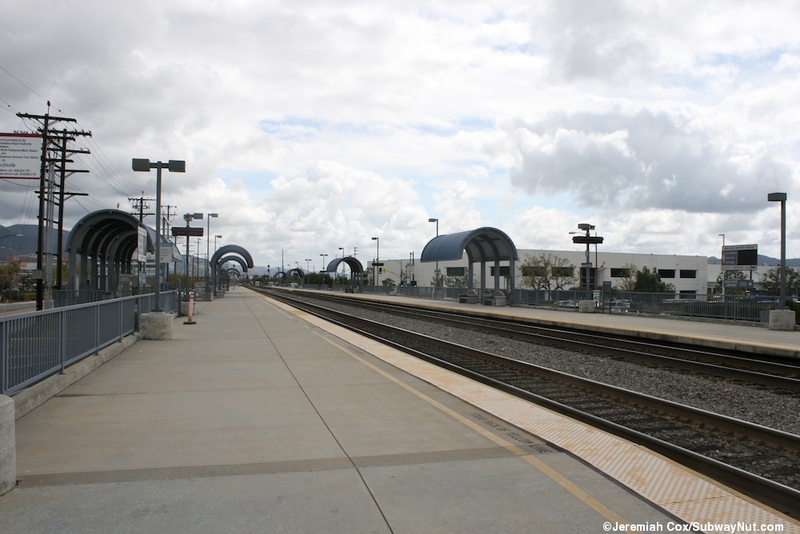 The platforms are connected by two pedestrian grade crossings (one in the middle, one at the western end) with lights and bells. 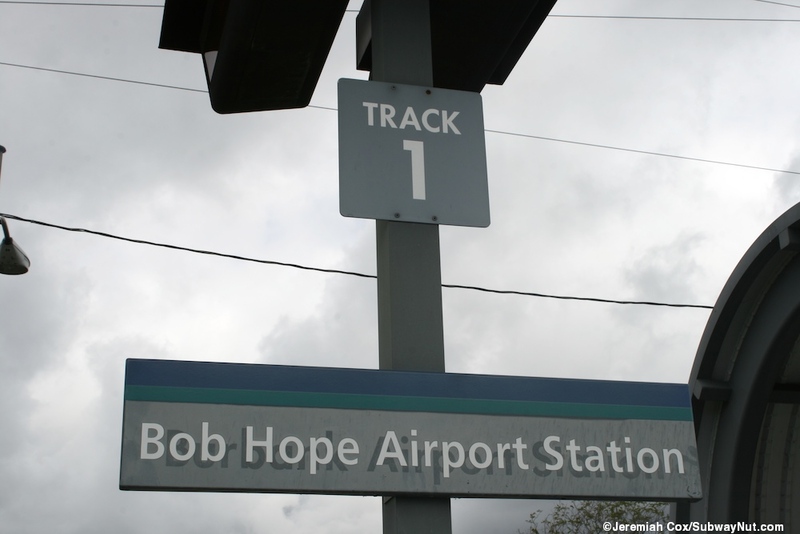 Along Empire Avenue and the north platform is the 'main station entrance' with two more blue round canopies with white Bob Hope Airport Lettering on both sides and the Metrolink TVMs beneath, but just the standard short ramp and staircase down to the street. Just west beyond the platform here is the station bus loop with two bus shelters for one Metro Bus Line and the courtesy phone to call the shuttle to the airport. 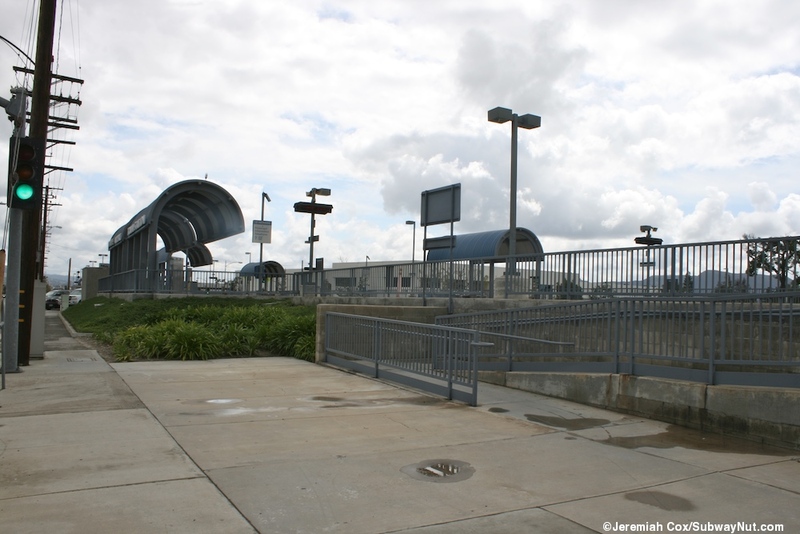 The Amtrak Thruway bus stops on each side of Empire Avenue just beyond the bus shelter.